A hangover from the Domestic Sluttery belated Christmas party wouldn't usually be the best foundation for an inspiring cocktail recipe. A hazy memory of salted caramel brownies, a few cheeky vodka royal gimlets and some superficial bathroom renovations (I may have broken the shower pole) left me in a sorry state Saturday morning. However this was no normal Saturday, this was my first PDT Saturday. Please Don't Tell is a New York speakeasy described as a hot-dog joint for grown-ups. The main bartender Jim Meehan shakes a mean drink and finally published a recipe book last year. For some reason the UK release isn't for a few more weeks but I managed to get a friend to smuggle one back for me and thought the Archangel would make the perfect first recipe to share. With a bit of muddled cucumber and the absence of martini its a sophisticated negroni variant thats perfect to alleviate those winter blues. This post has nothing at all to do with the fact that Valentine's day is approaching. I just happen to have a thing about expensive undies. Especially ones from independent lingerie boutiques that are in the sale. I only discovered Beautiful Bottoms today and I'm a total convert already (they do tops too). Here are my favourite sale pieces. She does indeed have a beautiful bottom. Once you've stopped staring at it, check out her lingerie. The Autumn Muse collection is so pretty. The camisole is reduced to £37.50, the knickers are £21.75. If you fancy the playsuit, that's £61.50. Nope, the Vintage Blush collection is no good for larger busts. But then, I don't think it's meant to stay on for very long. The Antique Bird range might be my favourite. Especially the printed silk robe. I really, really want that robe. I love love love the colour of the Florence range, but I also love how well the pieces mix and match together. All you have to do is choose your favourite. And try not to get drawn into the very beautiful 2012 ranges all inspired by birds. It's all luscious. We've been a little bit chatty recently. Our inboxes are often a flurry of debate and discussion (and cute puppy pictures) and we've decided that we should make our discussions a little more public. 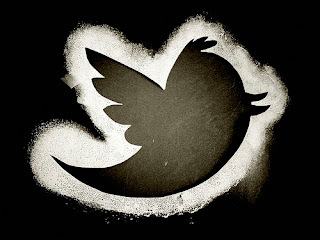 So we're inviting you to our very first Twitter chat. The first Domestic Debate will take place next Tuesday 7th February at 8pm (we've checked, there's nothing very good on the telly) and we're going to be asking the question 'are we over vintage?' We'll be discussing everything from Etsy and 'shabby chic' to the vintage-inspired high street and car boot sales. We're expecting things to get lively (not least because even the Domestic Sluts can't agree with each other on some issues around the debate). You can follow us over at @DomesticSluts and using the hashtag #DomesticDebate so you can follow the discussion and if you're not a Twitter user we'll also be asking the same question on the Domestic Sluttery Facebook page so you can get involved over there. Looking forward to chatting to you all! For most of team Domestic Sluttery, flamingos are the sausages dogs of the bird world. Adorable, a little bit silly, funny legs and our absolute favourite birds. 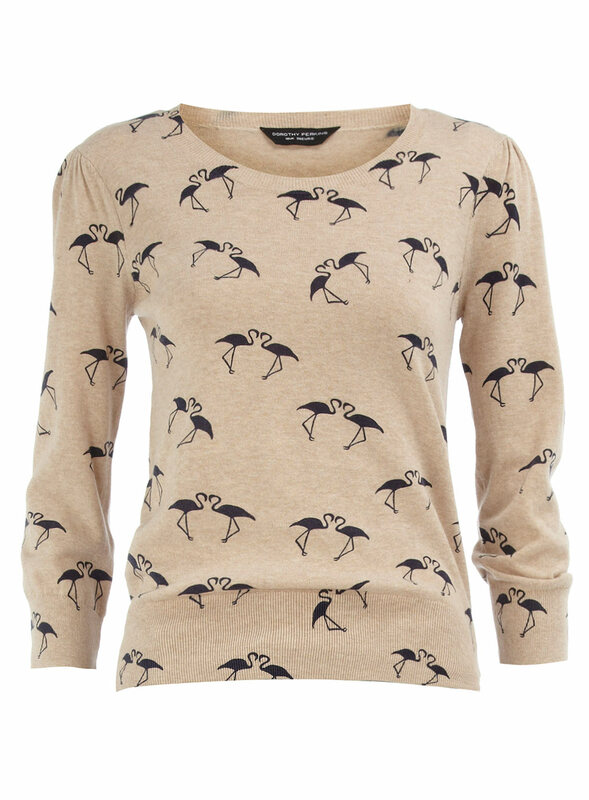 Yesterday while out shopping (I went out for spinach and came back with a new dress), I spotted this gorgeous flamingo jumper in Dorothy Perkins. It's soft and snuggly (if a little thin given that it's £28) and while I would probably wear it with jeans, I'm willing all of you to make like a flamingo and wear it with bright pink tights. Love it or hate it, it's nearly Valentine's Day. If you're looking for something non-soppy for your geeky other half , you could do worse than checking out Wall Envy Art on Folksy.. There are no kittens, flowers, or "I wuv oo soooo much!" messages in their Gifts for Geeks section. Messages are hand-inked onto pages of old algebra textbooks. Euler's Identity, above, is considered one of the most elegant formulae in mathematics (apparently - I did Maths A-level but we didn't get round to that). 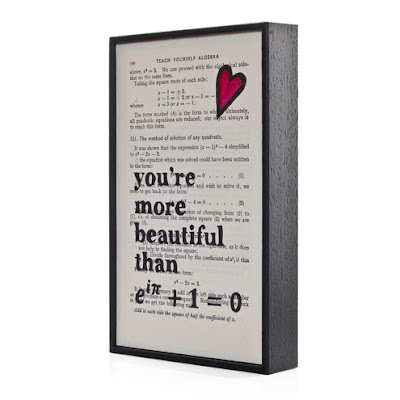 Make a number nerd's day and tell them they're even more beautiful. 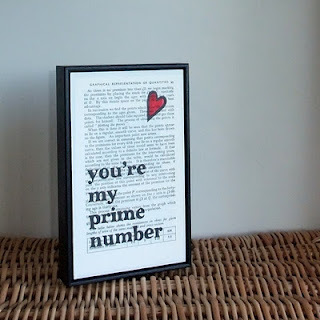 Prime numbers are pretty special. They're only divisible by 1 and themselves, seem to occur at random and can be used to encrypt codes. I've got a great fondness for those guys. 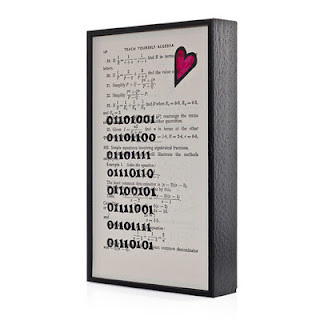 This says "I love you" in binary. Pretty awesome. It's currently only available in a set of three. 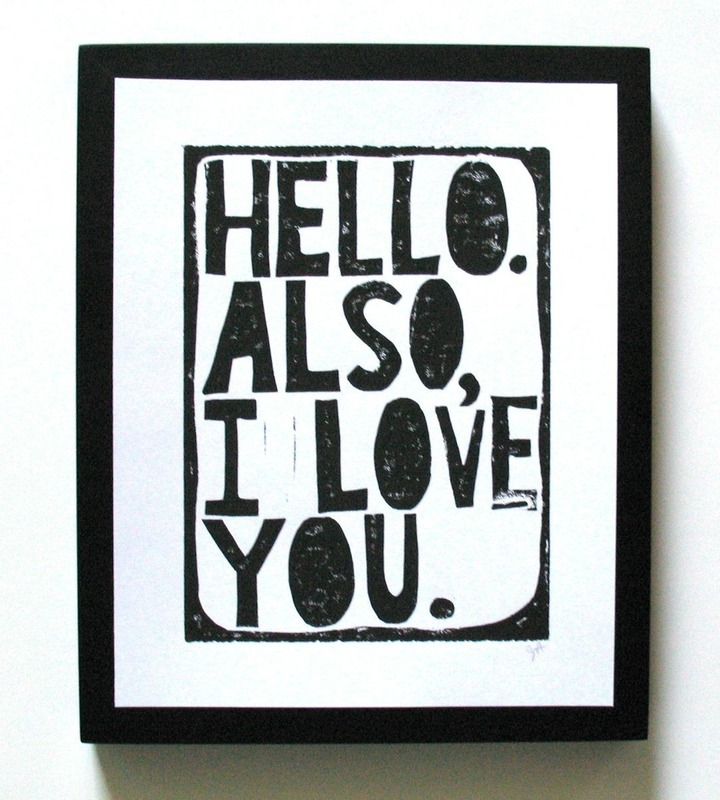 They're £20 each or £43 for three, and come in a lovely chunky black frame. 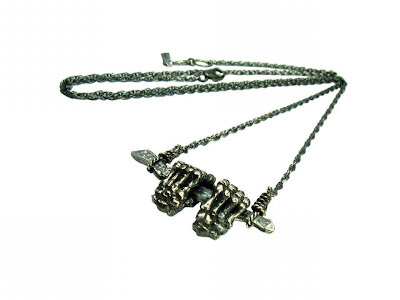 And if you don't have a significant other to buy for, get one for yourself. YOU'RE most beautiful than Euler's Identity, dammit. If you suffer from koumpounophobia, look away now. 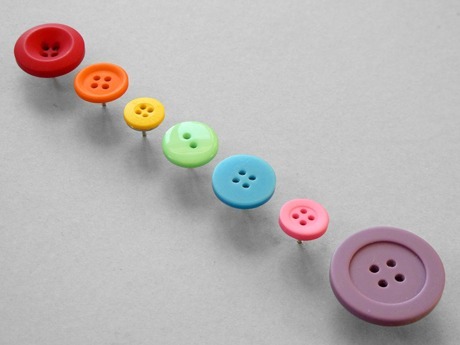 It sounds like one of the worst kinds of phobias to me as I can never resist a pretty line of buttons, whether that's on a blouse, skirt, gloves or in a pile in a charity shop. I spent half an hour last Tuesday fishing through a bag finding the perfect ones for my cardie. If you also like how they look but, honestly, you've got better things to do with your time, take a look at these cute as a button products. As is so often the case, this selection starts with something from the magnificent Present and Correct. These beautiful button push pins will fasten notes, love letters and shopping lists to your board in the prettiest possible way. 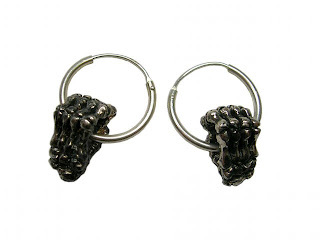 They're £14 for the set. 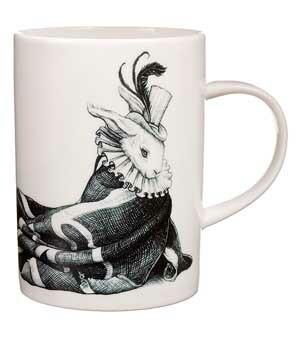 Just as charming is this Button mug by Blackbird Studio available over at Culture Label, the perfect mug for a crafty miss. It's bone china and costs £8.50. For a less twee twist on the look, how about Laura Egbi's Simple Treasures cushion available at the Graduate Collection for £40. You can only tell it's made up of hundreds of buttons when you peer closely. As for the hot pink colour? Well, it certainly lives up to the phrase 'Bright as a Button'. 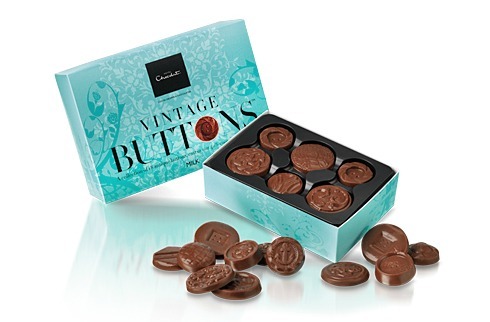 And finally for some buttons that are guaranteed to go down well with just about everyone, try these vintage milk chocolate buttons from Hotel Chocolat. A box costs £7 and their various shapes and patterns make them almost too pretty to eat. Almost. I have Pip McCormac to thank for this little treat. This (frankly ridiculous) poodle side table appeared in the Sunday Times Style magazine yesterday. I want to hate it. I don't even really like poodles. Yet I can't not love it. The ridiculousness is exactly what I love about it. He's got a tray on his head! It ticks all of the boxes of the silly part of my brain and I really do like the silly part of my brain. I don't think I'd ever buy it (it's a huge poodle, for cryin' out loud), but I really do like it. It's £195 from The French Bedroom Company. What say you? Cute? Creepy? Just really very stupid? Collections fascinate me. It doesn't matter what's being collected. It's the idea that someone might get so excited about something that they want everything related to it. I spent a large part of my childhood collecting postcards of Flamenco dancers embroidered with silk. We've got a section in the Domestic Sluttery book dedicated to displaying your collections. Collecting makes us happy. That's why Obsessionistas is so lovely. It gets my happy face on in the same way that Things Organized Neatly does. They're chats and interviews are carefully curated into a gorgeous website and it makes for very addictive viewing. I say viewing because it feels like you're in a little museum. There's Emma's collection of vintage women's magazines. 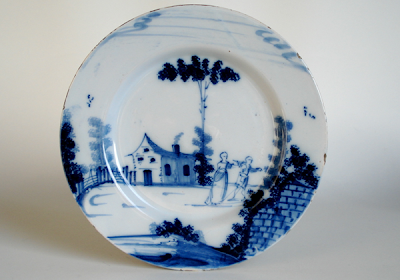 Or this extensive collection of Delftware. 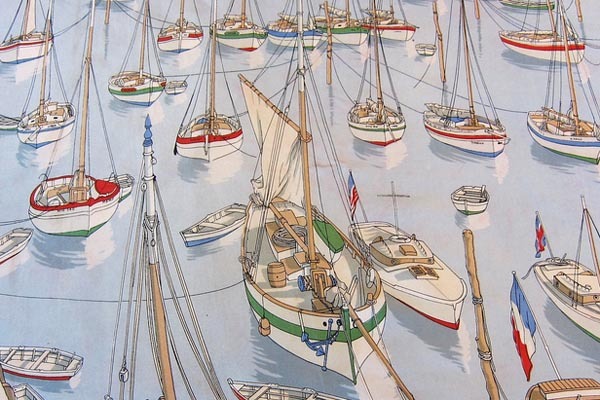 Jan has a gorgeous collection of Hermes scarves. I love that I don't know what collection will be next. I love that it makes me want to collect something new each day. It's the perfect mix of interesting people and their quirks, and really really cool stuff to look at. I've had about two hours sleep, I woke up to roadworks and we've run out of tea. My smiles were not forthcoming this morning. I've been in a grouch. 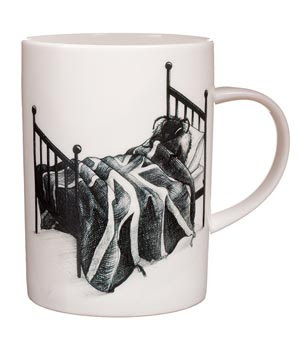 Until I saw these Rory Dobner mugs. 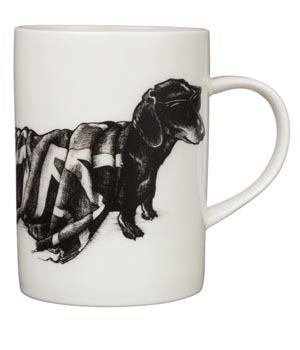 Each one depicts a cute animal and a Union Jack. This one is called Hot Dog. Because he's under the flag and it's keeping him warm, see? This is Bee In Bed. He looks happy. I bet he wasn't woken by roadworks. I like Rory's drawings so much. They're classy, but they always surprise me. The wrapped up wabbit is my favourite. There's 30% off at Roost Living so they're just £10.50 each. I can't decide if I like these more than Dobner's alphabet tiles, but they're all adorable and they're making me smile indeed. And so, my bacon obsession continues. As I consider bacon to be one of my five-a-day it is safe to say that I love bacon. I have garnered a small reputation with my bacon brownies, and have spent many hours discussing my love of bacon to anyone who will listen. 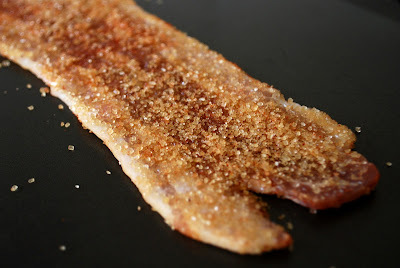 So when a twitter friend suggested candied bacon to me, I immediately set upon making it for myself. 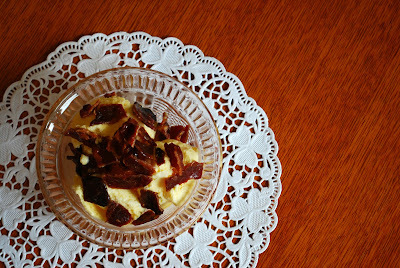 Within a few hours I was sat in the kitchen eating a bowl of vanilla ice cream with candied bacon sprinkled on top. Candied Bacon tastes like a gloriously sweet and crunchy bag of Frazzles. Those were my favourite crisps growing up, unsurprisingly for those that know me. The sweetness cuts through the smoky savoury flavour and marries perfectly well with vanilla ice cream. I actually found it rather more-ish. Preheat the oven to 180C as you prepare the bacon. Combine the sugar and spices in a shallow bowl and press the bacon into the mixture on both sides. Place the bacon on a baking sheet and bake in the oven for 15 minutes. Remove from the oven and using a baking brush coat one side of bacon with the maple syrup. Return to the oven for another 5 minutes before turning the bacon and coating with more maple syrup. Place back in the oven for another 5 minutes. Place the crispy bacon on a small dish and refrigerate to harden. At least an hour will suffice. Crumble into pieces and sprinkle over a bowl of vanilla ice cream. I'm still hunting for lovely things to put on my walls. And other than kittens, gin and salted caramel, what is lovelier than love? I'm not one for ridiculous declarations of amorous affections which is why I love the simplicity of this print by The Big Harumph on Etsy. It is polite and to the point which somehow makes it all the more romantic. If you want efficient romance, it can be yours for $26.75 (including shipping which at the moment is about £17). Marvellous. There is nothing nicer than starting your weekend with a full cooked breakfast. It says a cheery goodbye to the working week and sets you up for two days of doing whatever you please. For years, like chumps, we've been cooking up our bacon, sausage, mushroom, tomatoes and toast separately. What time-wasting idiots we've been! For behold: I have created a loaf with breakfast INSIDE. No longer is toast relegated to the side of the plate: it now takes centre stage. It is the delicious, crusty casing for whichever breakfast bits make up your dream meal. All this, and it's only 20 minutes work. Ok, it takes a little longer from start to finish (around 3 hours) but for most of that time you'll be sitting around, reading the paper, drinking coffee and shouting at Saturday Kitchen. I was quite conservative and just added veggie sausage, sundried tomatoes and mixed herbs, but you can add whatever you like. Cook your sausage and bacon first. I imagine you could leave the dough to rise overnight in the fridge, meaning you could get this ready on Friday night and pop it in the oven on Saturday morning. The recipe came out of my brain, but the 'no knead' method comes from the godlike genius that is Dan Lepard. Up to 200g breakfast bits - crispy bacon, cooked sausage, crumbly cheese, sun-dried tomatoes, herbs. Mix the flour, yeast and salt in a bowl. Drizzle over some olive oil and roughly rub through. Add your breakfast bits. Add the water in four or five big splashes, mixing all the time. Bring it all together into a sticky dough, cover with a teatowel and leave to rest. After 10 minutes, tip out the dough onto a floured surface. Knead for a minute by holding down one edge of the dough, pulling the other edge away from you and then folding it back, making a quarter-turn and repeating. Lightly oil the bowl, the add the dough and cover with a clean teatowel. Knead twice more at 10 minute intervals. Now leave it alone for 45 minutes to let it rise. Then gently tip it out, press it down to push the air out, then shape into a round on a lightly oiled tray. Leave it for another 45 minutes. Preheat your oven to 200C/400F. Dust the loaf with flour and slash it down the middle. Bake for 35-40 minutes until golden-brown. I hope you all had a great Burns night on Wednesday and that you're all now haggis and whisky converts. My dad's side of the family is Scottish and I hate to miss an excuse for midweek gluttony and excess, it also seemed a great theme to base todays drink on. I have to prefix this recipe with an appeal. If any of you ever meet my grandfather, I certainly didn't suggest replacing the traditional blended whisky base with single malt and I definitely did not advocate bringing ice within a square mile of Scotch. If he finds out I'll probably be disinherited. The Penicillin is a little like a younger, more Scottish Whisky Mac mainly thanks to the tang of the lemon and some lovely Scottish honey. 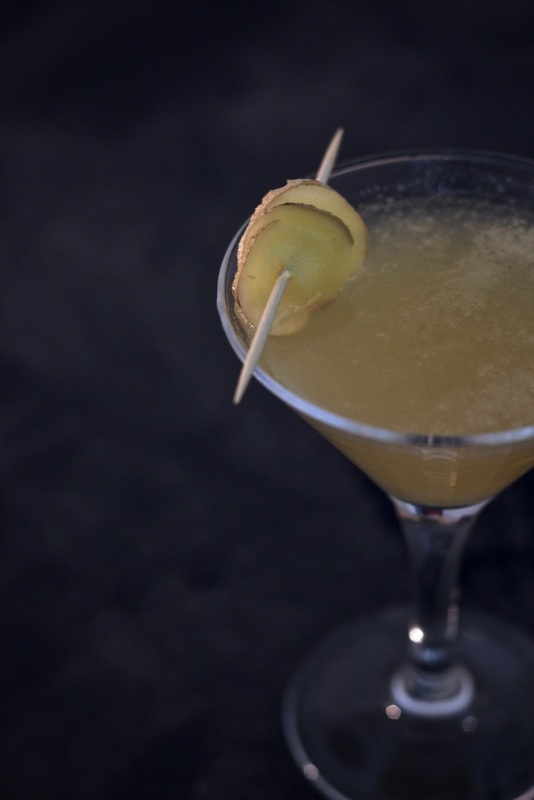 If ginger isn't your thing you could try making a single-malt sour using the tip at the bottom of this recipe or even go the whole hog and try the Atholl Brose... a veritable meal in a glass. 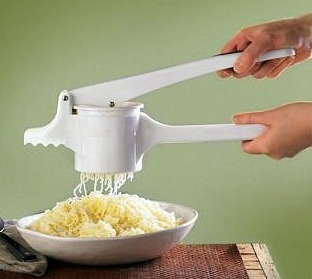 The first time I used a potato ricer at a cookery class, it was a revelation. Even after Nigella had been banging on about them for years, it had seemed like an added extra and something that I couldn't justify space for in a tiny kitchen. 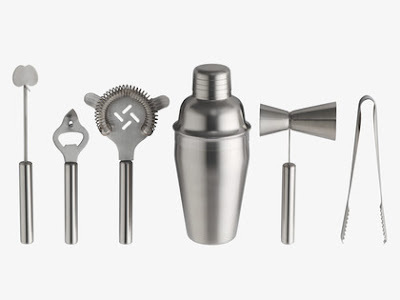 I'm still not going to pretend that they are essential but a ricer is to fluffy potatoes what a hand mixer is to cake making, i.e. you could use a wooden spoon to cream butter and sugar, but you're mainly building up builders' biceps on one arm. There are different types of ricer, mainly metal or plastic. I went for a metal one, and didn't realise it came with two discs in it to produce different consistencies of mash - slightly rough or super fine. I'd recommend choosing one or the other and not trying to smush the potato through both at once, ahem. My only problem with the metal ricer is that the handle which you squeeze together together to push the spud through the chamber and the disc is a little bit sharp. I'd recommend one of the plastic ones instead, which are easier on the hands. 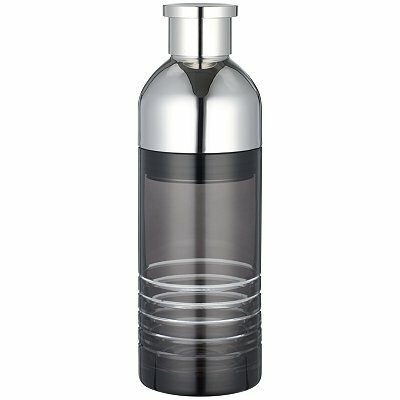 Ricers retail from about £10 upwards, such as the Lakeland one pictured which is £12.99. Look forward to making the creamiest mash, easy purees and pillow-like gnocchi with your new toy! It's the Domestic Sluttery Christmas party tonight (yes, we know we're a little late but we spent most of December signing your books and having Christmas naps). Nick is obviously in charge of booze, so here's a roundup of some nice cocktail shakers to play with. Gosh it's pretty, John Lewis. This makes drinks of magic, I'm sure of it. 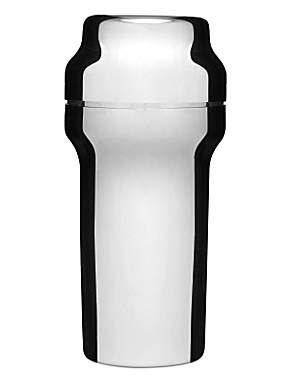 It's 'all about the Boston shaker', according to Nick. It's gold plated. That's pretty cool. Or why not go for the whole kit and kaboodle? My best friend turns 30 in March and we're planning a 1940s party at the gorgeous little village hall where she got married. It's going to be darling. However, whilst the theme may be wartime, the nibbles most certainly won't be; and I'm getting my practice in early to ensure her party is suitably decadent. The first recipe under scrutiny are these yummy coconut and champagne cupcakes. Separate the eggs into two bowls. Beat the butter and half the caster sugar together until smooth. Lightly beat the egg yolks a little at the time to the butter and sugar, then add the vanilla essence and lime zest. In another bowl, sift the flour, salt and baking powder. Add the coconut and blend. Add the flour mixture, a little at a time, to the butter mix. In between adding the flour add a little of the coconut milk. Blend in a figure-of-eight making sure you get plenty of air into the mix. In a third bowl, whisk the egg whites, the rest of the sugar and the cream of tartar together until soft peaks begin to form. Fold in the egg whites to the flour and butter mix with a plastic spatula, taking time to ensure it's blended but not over-mixed. Divide the mixture between 12 cupcake cases and bake for 18 minutes, or until the cakes are risen and golden brown. Blend the butter in a bowl until smooth. Add the icing sugar a cup at a time, sifting first. Once you have a smooth blend, add the champagne a tablespoon at a time and combine. Once the cakes are baked and cooled, ice the cakes with plenty of buttercream, using the back of a spoon. Hold the spoon and rotate the cupcake. Once the cake is evenly covered in frosting, bring the spoon to the centre of the cake and pull the spoon away leaving a little frosted peak. If you want to colour your buttercream then add the colour at the same time as the champagne. Don't forget that too much liquid colouring can cause a bitter taste so look into coloured gels if you're looking for really rich colours. Oh, and also don't forget that green liquid food colouring is a big fat waste of time - if you want green use one part blue to three parts yellow. A few months ago, I wrote about having finally found a dress I was going to buy on ASOS. I lied. Or rather, I never got around to buying it. This time though I bought three and kept two. I absolutely love this owl print dress! It's £32 and incredibly cute, although sadly doesn't come with the red belt you see in the picture. Funnily enough, despite not being a tall-specific size, it's a lot more decent to wear in public than my similar Topshop Tall mini-dress which requires shorts, or at the very least, tights worn underneath to ward off any potential arse disasters. I love the flattering sleeves and the jersey wrap style, and it's got two cute red lines on the top by slightly puffed shoulders. 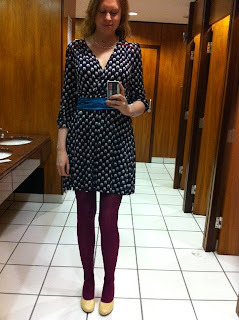 I wore it to work yesterday (yes, this is yet another WIWT picture taken in our Mad Men loos) with my favourite multi-purpose blue ribbon as a belt, pink Topshop tights and Amber & Jade Aretha heels. Happy old me. 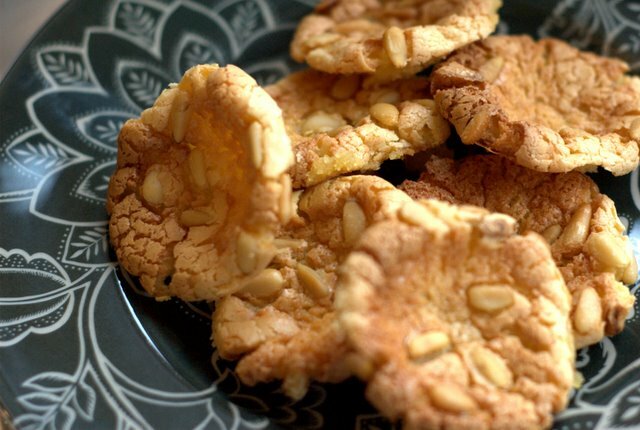 Pignoli are a sticky little riff on amaretti biscuits, made with almonds and pine nuts. They're naturally gluten free and pretty quick to knock up in a hurry. 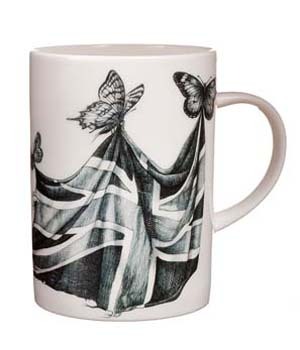 Perfect with your morning cuppa, or afternoon cuppa. Or for breakfast (ahem). They'll be very soft when they come out of the oven, but will firm up as you leave them to cool (if you can). Preheat the oven to 170c / gas 3. Gently mix in the icing sugar and the ground almonds. Line a baking sheet with baking parchment. It's a good idea to brush it with some oil or melted butter as the pignoli are quite sticky. Put teaspoonfuls of mixture onto the sheet. Space them well apart as they will puff up when cooked. Sprinkle each one with a few pine nuts. Bake for around 15 minutes until golden brown. General clumsiness, the fact I'm perfectly sized to poke the average commuter in the eye, and an inability to look out the window to check the weather before leaving the house: all these things make me a very bad brolly user. At the age of 31, I still haven't quite mastered the correct use of an umbrella. So when I read about Bubble Betty over on Retro To Go I knew that I'd found the answer to my wettest dreams. 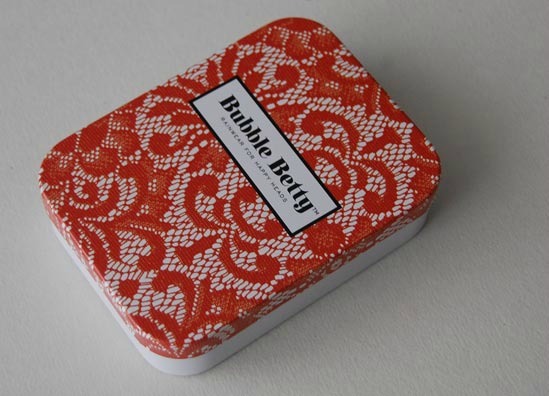 Like most things I want to buy, the bubble betty is a modern version of something your gran would have had. 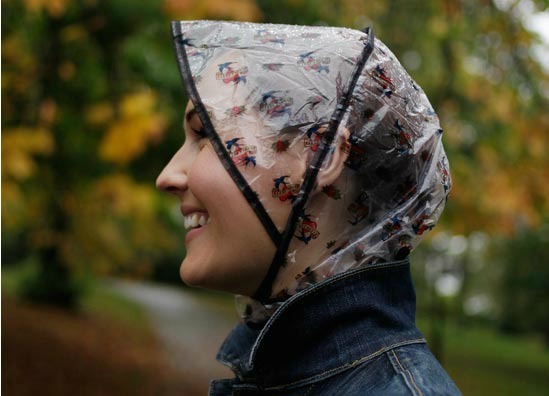 In this case that's a rain bonnet. 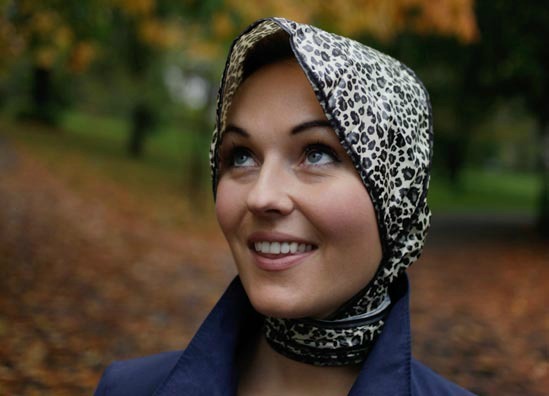 After years I've spent wishing rain bonnets were still stylistically acceptable, this brave company have seized the day and tried to make it so. The bonnets have been made-over with bright patterns that have just the right amount of retro (they know their target market), like this leopard print number pictured. Or this tattoo number - see-through so you can show off your pretty hairdo underneath too. Also available with a black or red lace pattern, each design is given its own special tin, so you can keep your bonnet safe for that inevitable rainy day. Each bonnet costs £6. Weigh that figure up against all the umbrellas you break or lose over the average year. Okay, you'll probably get a few stares on the 8.22 to Victoria, but at least your hair will be nice and dry. And your follow commuters will be spared any further umbrella related injuries. With Valentines Day approaching I have been on the lookout for gifts that are a little more personal than the standard chocolates, flowers and big red heart options. I want something to keep, something that is one of a kind, or even something with my name on. 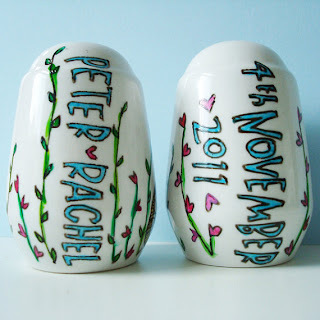 These personalised salt and pepper pots are on my list of potential Valentines gifts. They are simply adorable. 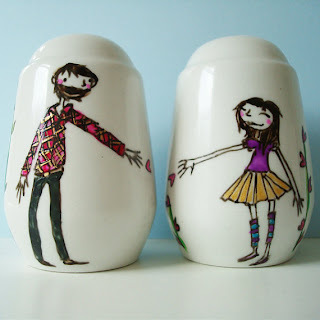 Illustrated and hand-painted by Joy Nevada Hale, these custom made pots are probably a great gift for all kinds of occasions. 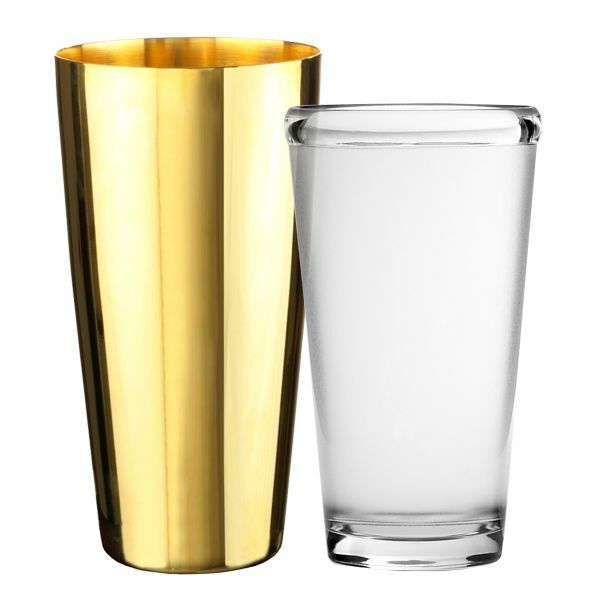 Wedding present for your best mate perhaps? Each set costs just under £30. You simply send a photo with your order and a week later you will have your own set of personalised salt and pepper pots. You can find more cool illustrations and personlised products at JoyNevada website. This new jewellery collection from Momocreatura is chilling. Titled, 'Le Cirque Macabre' is creeping me out more than a little. Yet I can't stop looking at it. See? It's creepy! Fabulous creepy, though. It's like a circus performer died while playing on hoops. THAT'S CREEPY. Watching a whole skeleton circus is frankly scaring the bejeezus out of me yet I can't not love this range. it's stunning and I've been staring at it for days. I know I like something when I keep clicking on the bookmark. Prices start at £105 from Luna & Curious so it's too pricey for me. Just as well, I'd give myself the creeps if I wore it. A couple of weeks ago I helped a friend move house which satisfied my twin fondnesses for a) helping and b) driving vans. Sadly, it turned out that I get monumentally flustered when driving vans with boys in, and as a result, I left both my headphones and my iPhone case behind. Still. I'd been lusting after Firebox's game controller iPhone case for ages so this gave me a nice excuse to treat myself. Except whoah - a swift bit of googling later and I'd found not only the wonderful For Her From You site but this frankly astonishing personalised NES iPhone case. Personalised! You can put literally anything you like on it! After a giddy few minutes envisaging a phone with Juniper Foxtrot Quantum Leap III on it in bold red type, I went with my name instead. It's £28.95 and comes with standard delivery. However, I also paid the £5 for express delivery which meant this iPhone case cost me - deep, deep concentrating doing-maths-face breath - £33.95. "That's completely acceptable," said my serpent-like desk neighbour, temptingly, "My iPhone case is incredibly boring but still cost me £20." Here it is. Isn't it AMAZING? I've showed this to pretty much everyone I've seen recently, brandishing it like a cross between the Triforce and Superman's business card. It's incredibly tough, although I haven't tempted fate by throwing it off the nearest building just yet. The one problem was that the company who sent it forgot to put my name on the packaging, which meant Colin from the post room had to open several layers before finding my name on it. Hurray for personalisation, but woe for my not getting to read the nice message to myself I'd written in the spirit of 'From Her To You'. I think it read something like "Dear Kat - I saw this and knew you would love this as much as I do. Lots of love, Me." I was probably having some kind of mental episode. However, I love this so much I might actually pass out. * I'm not actually sure if this is true - despite doing a tax return for five years I am still incredibly vague on the ins and outs of it. I am a terrible human being. I hope you took our advice to heart and were well feed and watered this Burns Night (though your arteries probably took less well to the deep fried tunnocks). If you are still in the mood for all things Scottish, may I direct you to the wonderful webshop that is Papa Stour? It stocks independent Scottish makers and designers and has its very own, very Scottish kind of look to it. Even without a dram of whisky in me, it makes me feel very nostalgic about when I lived in Edinburgh and it makes me want to pack my bags and leap on the next Flying Scotsman up there. 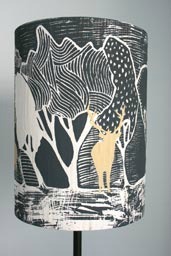 It's full of beautiful things, like this 'In the Woods' light shade by Bronagh and Zuzana. 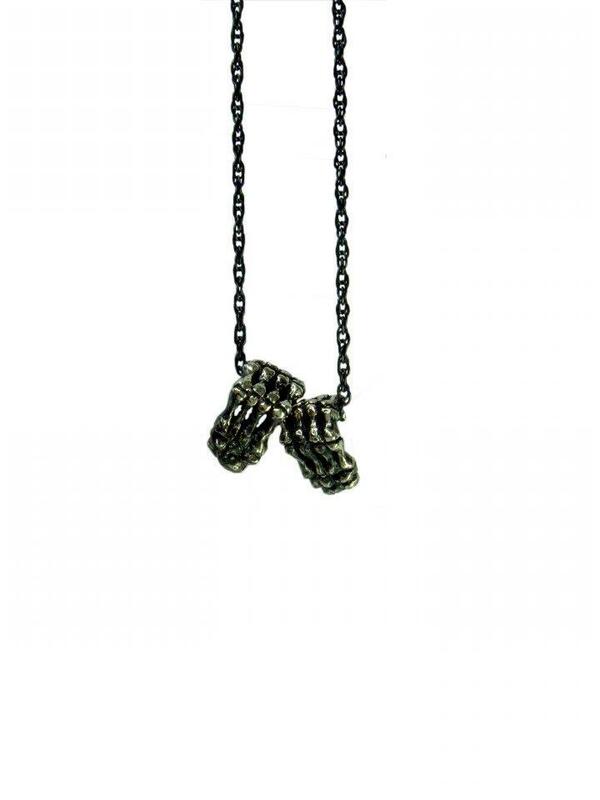 The design is hand-printed onto sand silk and costs £40. You can get one with hares too. Another thing Scotland is known for is its excellent knitwear. 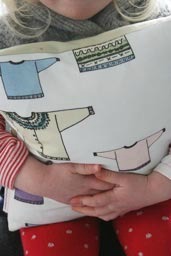 This cushion by Suzanne is illustrated with some excellent examples of said knitwear. It's £18 (cute Scottish child not included in price). There's great potential for buying unusual gifts too. 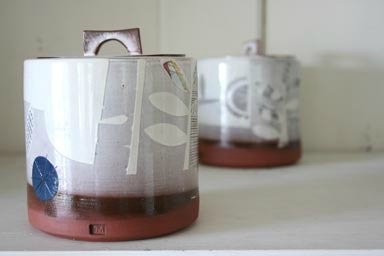 These ceramic jars are £30 each. Or for a saucier than average wedding gift, how about this minx? She's also £30. 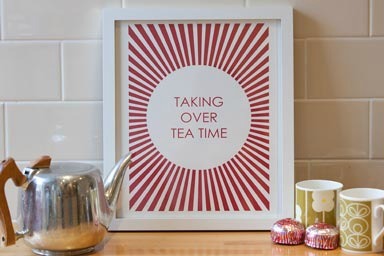 But if you still haven't had more than your fair share of teacakes, take a look at this Taking Over Teatime print, yours for £25. This one is definitely good for your heart. Friday Silliness: Mounted Crochet Dinosaurs!